KATOWICE, Poland, December 4, 2018 (ENS) – Heads of state and government, diplomats and climate scientists, economists and bankers have gathered in Katowice for the UN’s annual climate conference, and this one is anything but routine. Known as COP24, it has a daunting task. Over the next 12 days, negotiators are expected to finalize the rules for implementation of the Paris Agreement on climate change, unanimously agreed by 196 world leaders three years ago. The Paris Agreement requests that each country outline and communicate their post-2020 climate actions, known as Nationally Determined Contributions. The goal is to limit global warming to 1.5 to 2 degrees Celsius above pre-industrial levels. “There is no time for limitless negotiations,” UN Secretary-General António Guterres reminded delegates Monday. 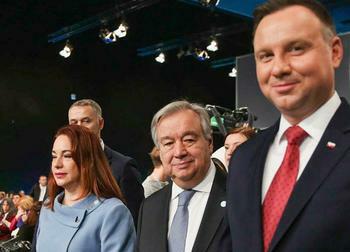 COP24, formally the 24th Conference of the Parties to the United Nations Framework Convention on Climate Change, opened Sunday under extreme pressure. A blizzard of dire climate science reports from the United Nations, the Intergovernmental Panel on Climate Change, even the U.S. government, have all come out within the past two months warning that time is running out quickly to do anything about the climate crisis. Extreme weather, droughts, wildfires, floods, sea level rise, wildlife displacement, melting glaciers, tropical disease spread, hunger, water scarcity, and climate migrants desperate to escape these disasters – all are being forecast for the near future – to appear in a decade or two at most. “We are ready to work with all nations to ensure that we leave Katowice with a full set of implementation guidelines and with the knowledge that we have served the world and its people,” Kurtyka said. The Paris Agreement is voluntary, no country is forced to do anything, countries do only what they agree to do. U.S. President Donald Trump, for instance, has decided to pull the world’s second largest emitter of greenhouse gases out of the Paris Agreement altogether. By contrast, President of Poland Andrzej Duda presented the Solidarity and Just Transition Silesia Declaration, supported by 37 countries, which addresses how to realize a low-carbon economy in a way that is just for all the people and communities affected. Most countries want to participate, but for many the barriers are financial. The World Bank Group is stepping up to help them. In 2018, the World Bank Group provided a record-breaking $20.5 billion in finance for climate action, doubling delivery from the year before the Paris Agreement and meeting its 2020 target two years ahead of schedule. Now the Bank has set a new target. The World Bank Monday announced the doubling of its current five-year investments for 2021-2025 to around $200 billion in support of ambitious climate action to boost adaptation and resilience in the world’s poorest countries. “Climate change is an existential threat to the world’s poorest and most vulnerable. These new targets demonstrate how seriously we are taking this issue, investing and mobilizing $200 billion over five years to combat climate change,” World Bank Group President Jim Yong Kim said. The $200 billion across the Group is made up of $100 billion in direct finance from the World Bank, and $100 billion of combined direct finance from the International Finance Corporation (IFC) and the Multilateral Investment Guarantee Agency and private capital mobilized by the World Bank Group. In a joint declaration issued on opening day, the nine multilateral development banks (MDBs) committed to working together in key areas considered central to meeting the goals of the Paris Agreement. “To realize this vision, we are working together to develop a dedicated approach,” the banks said. The MDBs plan to break their joint approach down into practical work on: aligning their operations against mitigation and climate-resilience goals; ramping up climate finance; capacity building support for countries and other clients; plus an emphasis on climate reporting. The MDBs will report back to next year’s COP25 gathering on their progress. The nine MDBs are: the African Development Bank Group, the Asian Development Bank, the Asian Infrastructure Investment Bank, the European Bank for Reconstruction and Development, the European Investment Bank, the Inter-American Development Bank Group, the Islamic Development Bank, the New Development Bank, and the World Bank Group. 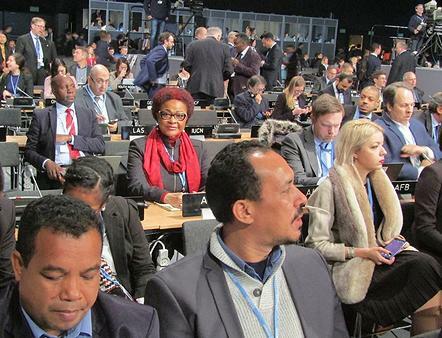 Today, the opening day of COP24, was devoted to Africa Day, a joint initiative of the African Development Bank, the African Union Commission, the United Nations Economic Commission for Africa and the New Partnership for Africa’s Development. They estimate that Africa would need US$3 trillion to implement the adaptation and mitigation targets in their Nationally Determined Contributions by 2030. But in reality Africa is receiving much less. Sub-Saharan Africa received an average of US$12 billion a year in 2015 and 2016. The Africa Day meetings were focused on enhancing Africa’s access to funding, capacity-building, technology development and transfer. As of November 2018, 49 African countries out of 54 – 90 percent – had ratified their Nationally Determined Contributions (NDCs), demonstrating the continent’s level of awareness of and commitment to fight climate change. 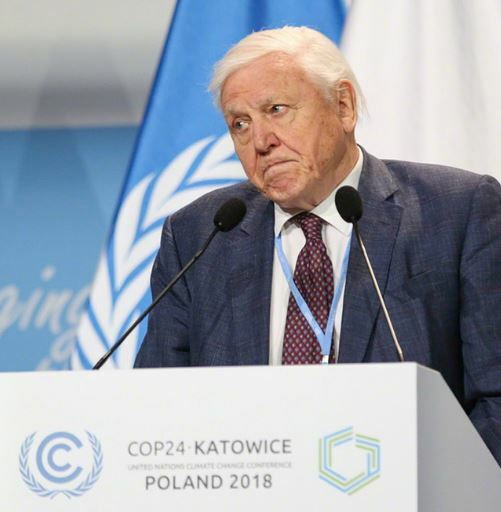 British broadcaster Sir David Attenborough used his opening day speech to launch a new UN campaign – “The People’s Seat” initiative. Working through ActNow.bot, the campaign is designed to give people the power and knowledge to take personal action against climate change directly on the Facebook Messenger Platform. The speech was preceded by a video <https://vimeo.com/304018764> produced with social media content posted in advance of COP24 using the hashtag #TakeYourSeat. Attenborough called “The People’s Seat” initiative the result of new activism shaped by people from around the world. The initiative allows people from around the world to send direct messages to decision makers by posting contributions on social media. “The world’s people have spoken and their message is clear – time is running out. They want you, the decision makers to act now,” Attenborough declared. 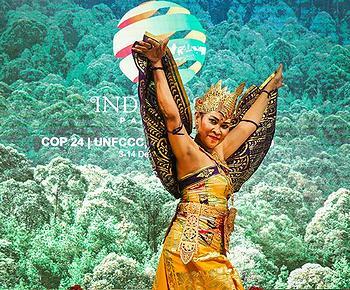 During COP24 action events will be held on human settlements, industry, transport, water, oceans and coastal zones, energy, forests, agriculture and land use. A high-level event on education will take place. * – SDG 9 (industry, innovation and infrastructure) and climate. Other groups will meet on: intergenerational inquiry; the fashion industry charter for climate action; sports for climate action; and tourism for climate action. The outcome – a finalized set of implementation guidelines – is expected to unleash practical climate actions with respect to all the targets and goals of the Paris Agreement – adapting to climate change impacts, reducing greenhouse gas emissions and providing financial and other support to developing countries.